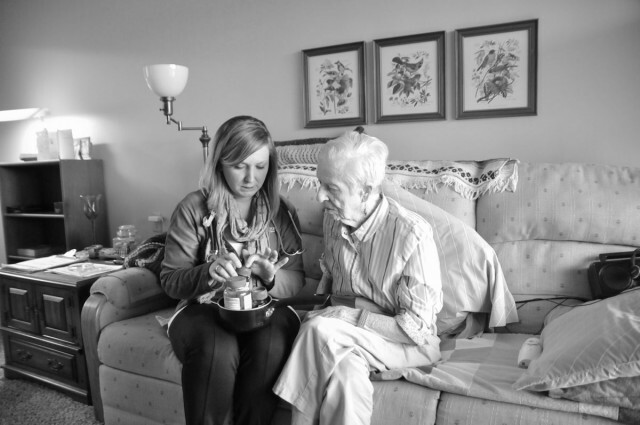 There is no such thing as a typical day in the life of a hospice nurse. And Thursday, April 2 was no exception for Holly McKay. McKay, who has been with Hospice of Michigan for three years, started her day arriving at the office shortly after 9 a.m. to prepare her schedule of visits. The first of which was just down the road from her office in Ada. Eleanor Simms, 94, lives in a retirement community, The Village of Heather Hills and has been a patient of McKay’s since January. She is legally blind, very hard of hearing and dying of liver cancer. The visit started with McKay asking Simms how she had been feeling for the past week. Considering her age and condition, Simms was surprisingly upbeat. They discussed Simms’s medication and her method for taking and distinguishing between the pills. McKay noticed that Simms may have been mixing her Benadryl and Prilosec. After creating a new system for Simms to distinguish between medications, McKay continued the visit, which resembled a regular check up with a doctor. Sometime between checking heart rate and blood pressure, McKay’s phone rang. Embarrassed that she forgot to turn the ringer off, she quickly jumped off the couch and silenced the phone. “I’ll call them back later,” McKay told Simms. On the way out of the building, McKay returned the phone call she missed 10 minutes earlier. The facility her next patient, Jane, 93, was staying at had some bad news. On the ride to Laurels of Kent in Lowell, McKay prepared for the worst and called other staff members associated with the case. Jane had been doing relatively well up until the beginning of the week. McKay calls Hospice of Michigan to make notification that a patient has died. Photo by John Rothwell. McKay made sure the family was notified of Jane’s rapid decline. Then she remembered Jane’s roommate. “Her roommate is probably scared to death,” McKay said as she walked across the parking lot. Jane died as McKay entered the building. McKay had to stay professional and do her job. She talked to the director of nursing, then went straight to Jane’s room and pronounced the time of death, 10:50 a.m. The family arrived minutes later and she left them to be alone with Jane, who was going to be cremated. This would be the last time they would see her. 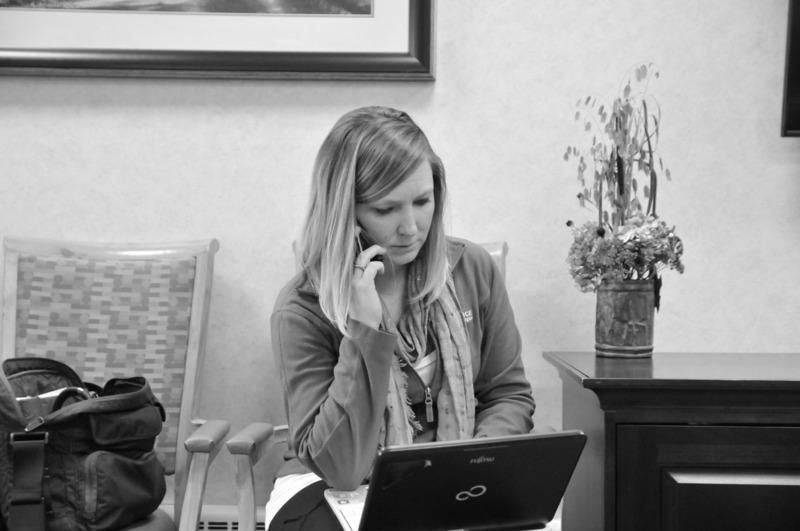 McKay went out to a waiting room to close her report on yet another patient. While Jane may have been ready to go, it’s the people who loved her, that must deal with the loss. McKay is confident that Jane’s family, which includes a son who used to volunteer at Hospice of Michigan in the grief support department, will be able to handle the grieving process. The fact that Jane’s health declined so quickly is another reason why. “I think it’s easier for the family,” McKay said. “You don’t have to see the prolonged stages of wondering, waiting, anticipating what is coming, but you can never face that final moment, even though you know it’s coming, until it actually happens. Every patient leaves an impression on McKay, some more than others, but she remembers each and every patient, no matter how long she cared for them. “There’s always something I can relate to with somebody, even if I don’t know them very long,” McKay said. “Maybe I only met them once. You can still find something about them that you connect with, which makes it more emotional for you, but you just learn to get through it, work through it and be happy with what you were able to do for them and for their family. In the profession McKay has chosen, there are difficult days, like the ones when she loses a patient, but she reminds herself that even though a life has ended, others must go on, including her own. 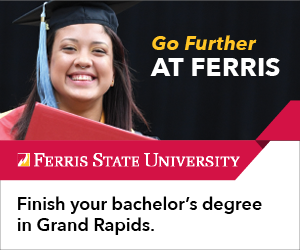 Chris is dual enrolled at Ferris State University, studying Computer Information Systems. He has earned his Web Design & Development and Web Technical Support certificates from Grand Rapids Community College. In addition to managing The Collegiate Live, he also designs the print and e-print editions of the publication. In what would otherwise be his spare time, he enjoys picking apart politics, sci-fi and comic books and works as a student tutor in the ATC Open Computer Lab.